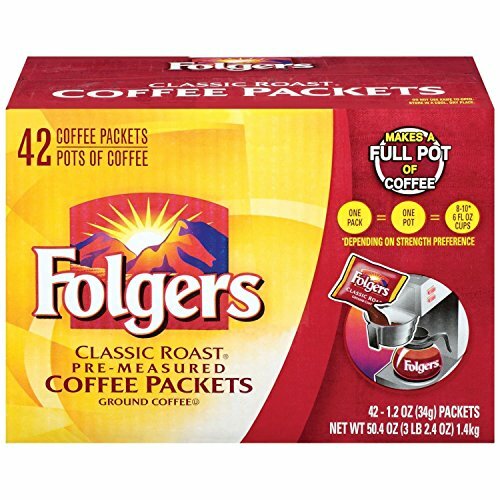 total: 252 ct Folgers Classic Roast is made from Mountain Grown® beans, the world's richest and most aromatic. Use these convenient pre-measured coffee packets to eliminate guesswork on how much coffee to scoop. Each packet makes a full pot of coffee. The hallmark of Folgers Coffee, Folgers Classic Roast has been "The Best Part of Wakin' Up" for more than 150 years-and for good reason. Medium roast offers a unique flavor that is fresh, bold and satisfying. Pre-measured coffee in a convenient packet eliminates guesswork. If you have any questions about this product by Folgers, contact us by completing and submitting the form below. If you are looking for a specif part number, please include it with your message.